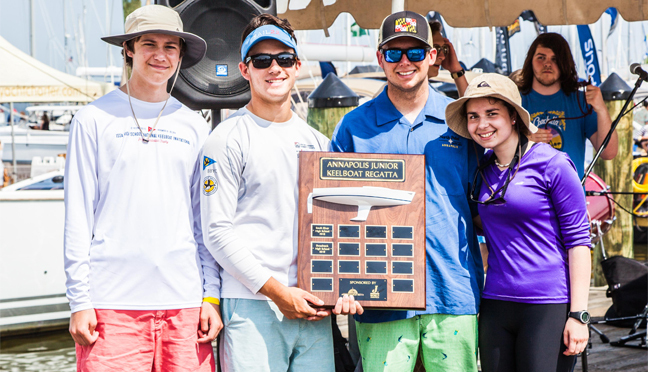 In 2017 Archbishop Spalding High School Sailing Team took home the win in the third annual running of the Annapolis Junior Keelboat Regatta. Light shifting winds created challenges for the five teams and also provided close competition, requiring precise strategies to play the shifts. 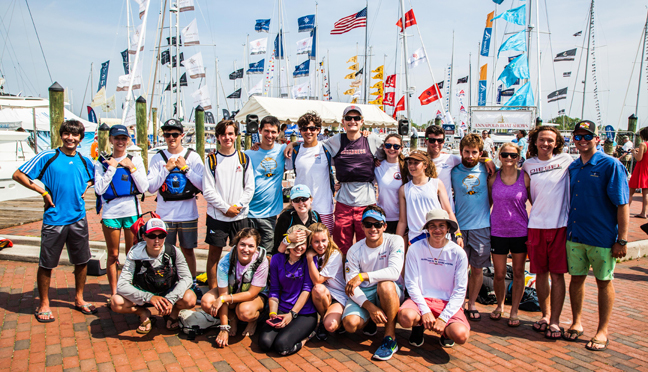 The regatta bought together five of the area’s top regional high school sailing teams to race just off the docks of the Annapolis Spring Sailboat Show in Annapolis Harbor. The fourth annual Annapolis Junior Keelboat Regatta will take place on April 21, 2018 at 12:00 noon, sponsored by J/World Annapolis and the Annapolis Boat Shows. The Regatta brings together seven of the area’s top regional high school sailing teams to race just off the docks of the Spring Sailboat Show in Annapolis Harbor. Students will be racing in J/80s graciously donated by J/World Annapolis. The defending champions Archbishop Spalding High School Sailing Team will take on Annapolis High School, Severna Park High School, The Key School, St. Mary’s High School, South River High School, and Broadneck High School in multiple round-the-buoys fleet races. Teams will compete for a traveling cup designed by Weems and Plath, which will be presented immediately following the race in Susan Campbell Park. The traveling trophy has gone to three different sailing teams in the past three years. South River and Broadneck high schools won previously. The 2018 Annapolis Junior Keelboat Regatta is sponsored by JWorld Annapolis, Annapolis Yacht Club Juniors Program, Severn Sailing Association, Helly Hensen, and the Annapolis Boat Shows. Will Comerford, Jake Vickers, Jack Irvin, and Nataila Pereira.